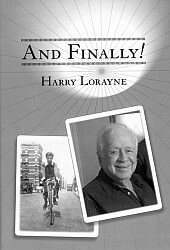 Categories > Card Magic > Harry Lorayne's new "And Finally!" book - which are your favourite tricks so far? I'm sure everyone who has a copy of Harry Lorayne's latest (and final) book And Finally! is thrilled to be enjoying this latest release - and well before the end of the year too! As with all his books, there's so much good material inside, I thought it would be good to hear from others which tricks you've especially enjoyed in this new book so far, and get some pointers for which effects you think especially stand out or deserve attention. I'll start by suggesting a classic, Lazy Man's Card Trick (page 123). Interestingly Harry himself writes in his after thoughts about this: "I stopped using the `lazy man's' presentation a long time ago." I'd love to know what presentation he does use today, and what others use in their approach to this wonderful effect. I've always enjoyed poker deals, so I really welcome Lorayne's Poker Deal Plus (page 217), which adds a fun kicker to an already solid routine. I also love the presentation he offers with Really! (p.75) which you can see him perform as part of his 90th birthday lecture here, and can be very entertaining when done well. Those who do have the book: Of the routines you have checked out so far, what are some of your favourites? Those who don't have the book: This might be a helpful thread to consult in the future if ever you do get the book, with some great suggestions for tricks to start exploring first! Even if you had never owned nor read a Lorayne book and this was your one and only exposure to his work, you would be privy to some of the strongest, most magical, impromptu card magic in print. Truly, a superb collection. Many artists fade with longevity, Lorayne gets better. Favourite tricks? There is so much to choose from in this volume. Quick Mate- this is an early favourite and I've been doing it- a LOT. It is something I will do for the rest of my life. Reversed Card Transmission- This one is a fooler. A borrowed shuffled deck is spread hand to hand under the table. The spectator chooses any card, turns it over, replaces it in the spread, and immediately takes possession of the deck and brings it above the table himself! The magician proceeds to divine the reversed card. Your Favourite Card- This one is pure gold. It can stand alone but Mr. Lorayne teaches it as a transition piece that can be done any time during your set. It is a baffling two card transposition that utilizes a selection that has already been in play in a previous trick. Intrigued? You should be. This one uses one of my favourite utility moves in all of magic which, as usual, is also taught in the book. Halo Aces- My favourite Card Trick of all time. There are effects in this book that have been published many years ago, some in books long out of print. Their inclusion in this new book is part of what makes it such a great collection. I'll revisit this thread going forward. "Jacks Are Better" (p.90) - This is one of Lorayne's own favourites, and is thoroughly entertaining. It employs the Lorayne Force and Universal Reversal to good effect, as efforts to find a selection first produce the Jacks, and these in turn reveal the chosen card. "That's The Truth" (p.111) - With nods to some ideas from Dai Vernon and Peter Duffie, this is a fun routine which features a very nice method of revealing a selected card under the guise of offering a lie detector test. The premise here is that you’re setting up a lie detector computer, and the very visual method to reveal the selected card is especially charming and unique. You'll already be familiar with this if you've seen Harry's 2016 Jaw Droppers Lecture. "Mental Vibrations" (p.166) - This is based on a great Bob Farmer idea, and ends with a spectator finding a card they'd thought of in their very hand! Hi Enders. Thanks for sharing these. That's the Truth is a "worth the price of the book" item in my opinion. Harry's impromptu setup is easy to remember and he has revealed a kicker ending for the first time ever in his Afterthought which in my opinion makes this a perfect opening effect and leads you right in to your set. Simply amazing, and further evidence that Lorayne's books must be read cover to cover with Cards in hand to mine all of their gold. This book just keeps getting better. It's been a month since the last post in this thread - surely some others have the book by now, and have some suggested favourites to share? Quick Mate by Lorayne... sorry, I’m in love with it. I tinkered for months with Harry’s blessing but guess what? His is better. You’d think I’d learn after 30 years. Enders - missed your original post. I have been working through every trick in the book with deck in hand, in order. Only up to pg 167. I am having a BALL! The thinking is brilliant. My intention is to complete the book, then dive into faves and they will be difficult to choose, this is good stuff. Two Over Easy is an excellent O/W routine. I am practicing that one daily to get the flow down. Mental Vibrations is an awesome bit of Mentalism, that's what I am learning now. Anyone looking to just pick through the book is going to miss a ton of stuff. That's the Truth is a cool lie detector as well. Preferred Take Five, Billustrious, A Much Better Chance - to name a few are also great. And, again, interesting, 276 views, your raves, etc. - but no orders. Interesting. Hey guys. Here's a gem from And Finally! It is a magical production of a Royal Flush. With Doc Valles Cull Down or any good cull it is completely impromptu and the onlooker can name the suit. The borrowed deck is shuffled and the deck tossed from left to right then from right to left leaving 4 cards face down. The cards are placed down and the shuffling continues: " I tossed from right to left and left to right, now let's toss down and see what comes up !" The deck is dropped to the table and an Ace of Spades appears face up on the deck. (Lorayne teaches this particular revelation better than anyone ever has, trust me) The other four cards are now turned over to reveal the other 4 high spade cards making a Royal Flush! This is a delightful sequence that should appeal to beginners or advanced card men alike. Just one of the countless gems to be mined from this excellent card book.